There are three girls in our house; Jenny (6), Charis (2) and Mummy (?? that would be telling!) That makes for a lot of pink clothing, glittery princess dresses and dolls. When Jenny asked for a doll for her birthday, I knew just the place to look: Petalina Dolls. 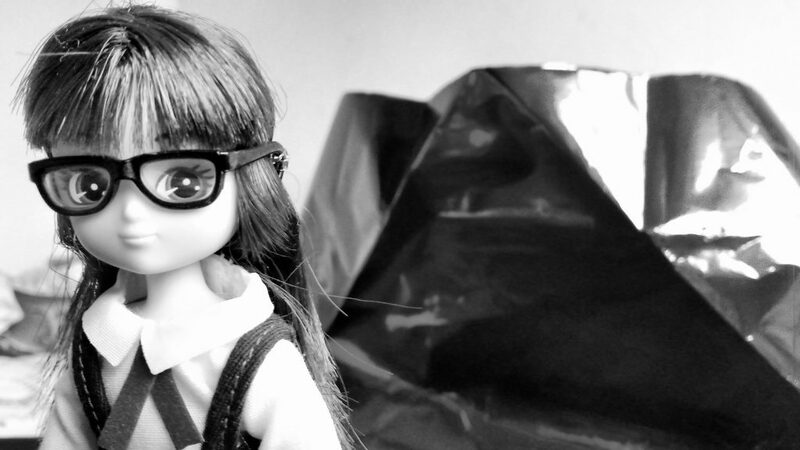 Petalina is an online store entirely dedicated to dolls. Whether you’re after a soft, squishy doll for a newborn, or a sophisticated, poseable doll for a seven year old, Petalina will be able to accommodate you. Their range of accessories and clothes is incredible too. Reading the guide, I really felt like I was getting some expert advice from someone who truly understood little girls and the importance of role play in their lives at this stage. Armed with the information, I started browsing the Petalina website and soon came across the Lottie Doll (£18.99). I instantly fell in love with Lottie. At just a 18cm tall, she is the perfect portable companion! I love that the Lottie doll is shaped on the proportions of a 9 year old girl. Too often these sorts of dolls have (completely unrealistic) womanly figures and skimpy outfits. 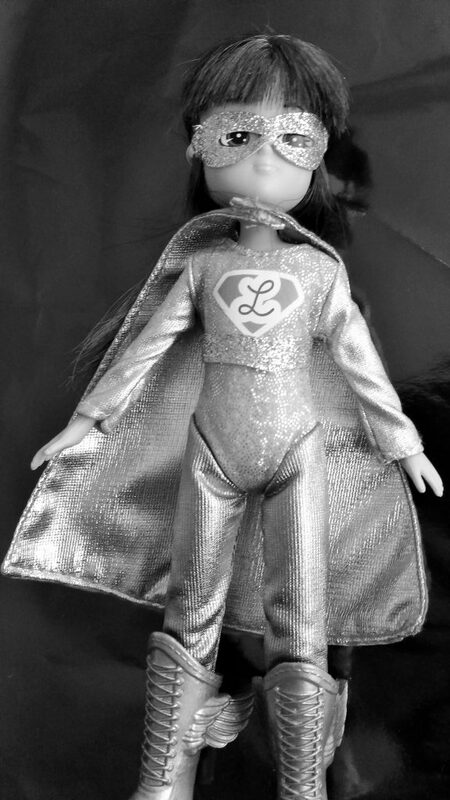 But Lottie’s creators, Arklu, wanted to create dolls that promotes healthy body image and celebrates childhood. This is something I feel passionately about, after my own beautiful girl started questioning her figure aged just 5 years old. I think it’s so important to let children know that they are right just as they are – they don’t need to be more grown up or thinner or wear more makeup. Looking down the range, the Lottie School Days Doll just jumped out at me. She has big, brown eyes and long, dark hair, just like Jenny. 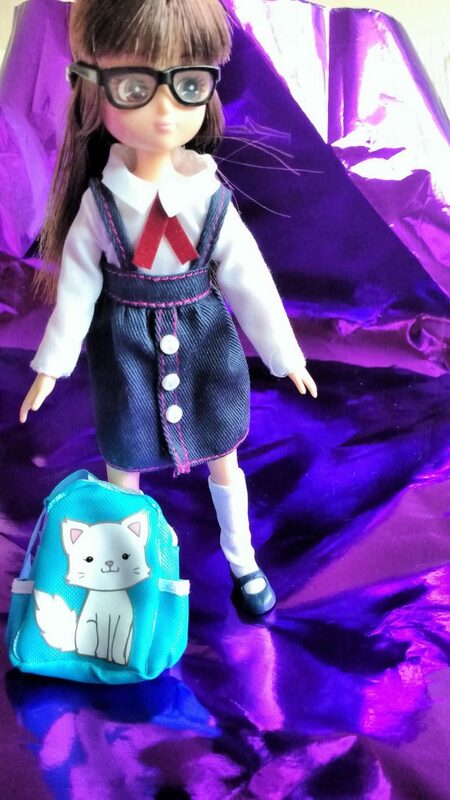 Her school uniform is so cute and for a little girl who loves to play schools, it would, undoubtedly, be a winner! I am a big believer in letting children role play their experiences; it helps them to process what is going on or think about what might happen. I think the Lottie School Days Doll would be a brilliant toy for any little ones about to start school, or who have to wear glasses. It gives them a chance to explore their thoughts and feelings in a safe environment. 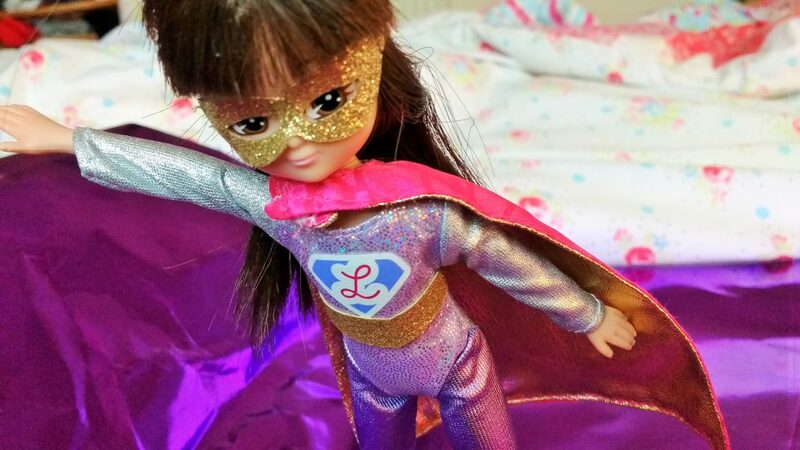 But the thing that really swung it for me, was when I saw the Lottie Superhero outfit. As I mentioned, Petalina stock lots of accessories and clothing for the different dolls they sell and you can buy the superhero outfit as an extra item. As regular readers will know, Jenny has requested a “Girls Superhero Party” for her birthday. I have been trawling the internet trying to find superhero merchandise that is feminine. Jenny is a girly-girl, but it seems like you can’t be a superhero unless you’re a tomboy! That is wrong on so many levels! Let’s teach our girls that they can save the world too. 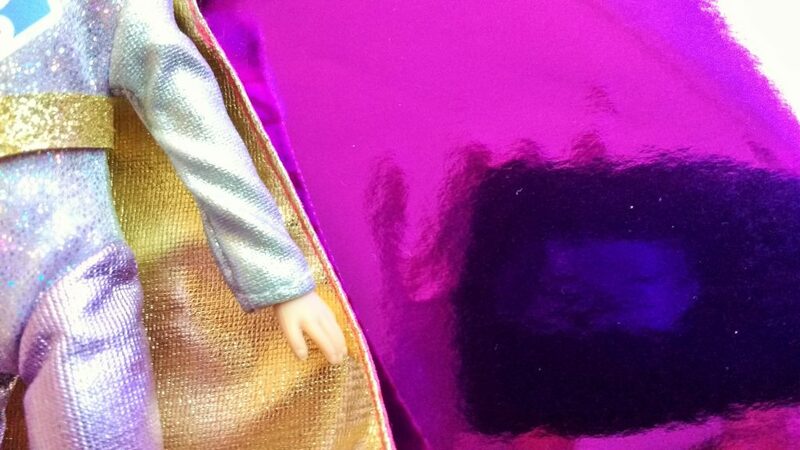 However, Lottie’s superhero outfit is pink and sparkly. She has a glittery mask and golden, winged boots. It was designed by a 6 year old who said that Lottie should inspire children to accept who they are. This fitted perfectly with my sentiments and the way I have been trying to raise my girls. I am proud to be supporting a company that feels so strongly about raising strong, confident women. The superhero outfit is just £9.50 from the Petalina website. If your little one loves pretending to be superhero, you could check out my post on hosting the ultimate superhero party, with lots of hints and tips for making it a day to remember. 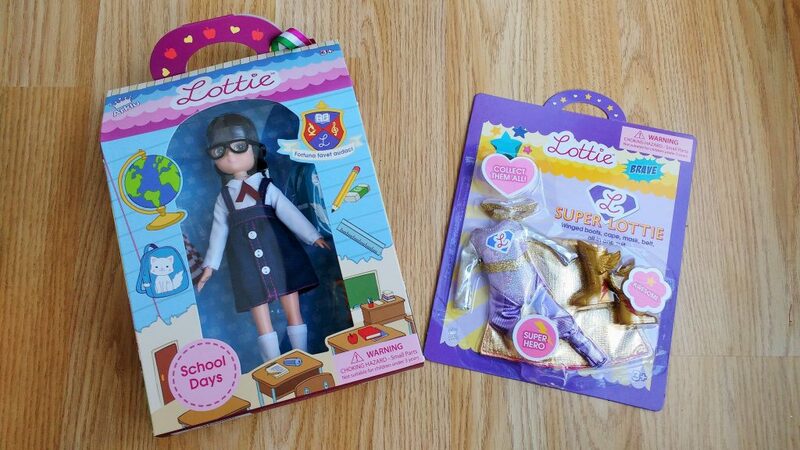 The lovely people at Arklu have kindly agreed to gift a Lottie School Days Doll and Lottie Superhero Outfit to one Lucy At Home reader! All you need to do is enter the competition via the Rafflecopter Widget to be in with a chance of winning this fabulous prize! Please check out the terms and conditions below and GOOD LUCK! No Purchase Necessary. Giveaway starts Mon 6th Feb 2017 at 00:01 GMT and ends Mon 6th March 2017 at 23:59 GMT. UK entrants only. There can only be one winner. That winner will receive both prizes. Winners will be selected at random using the random winner generator within Rafflecopter. The winner will be contacted by email and their name will be displayed on the giveaway page using the Rafflecopter widget. Where possible, I will also tweet the winner. Winners have 48 hours to respond before a new winner is selected. No cash alternative. Please note that Arklu are responsible for fulfilling this prize and Lucy At Home is not responsible for sponsors that do not fulfil their prizes. I have represented the sponsor with the expectation they will fulfil their prize and in a timely manner. I will only be passing your details on to the sponsor so that they can contact you regarding your prize. I will not share or sell your information and will use any information only for the purpose of contacting the winner. Facebook, Twitter and Google+ are in no way associated with this giveaway. 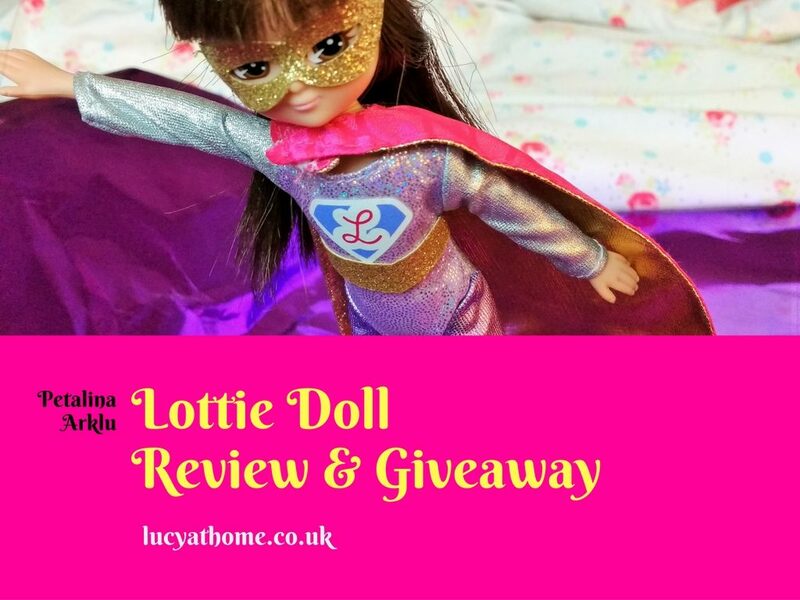 Disclaimer: I was given a Lottie School Days Doll and Lottie Superhero outfit for the purposes of this review. All opinions are my own. For more info, check out my disclosure policy. Lottie looks modern, appealing and life like – I think my daughter would love her! 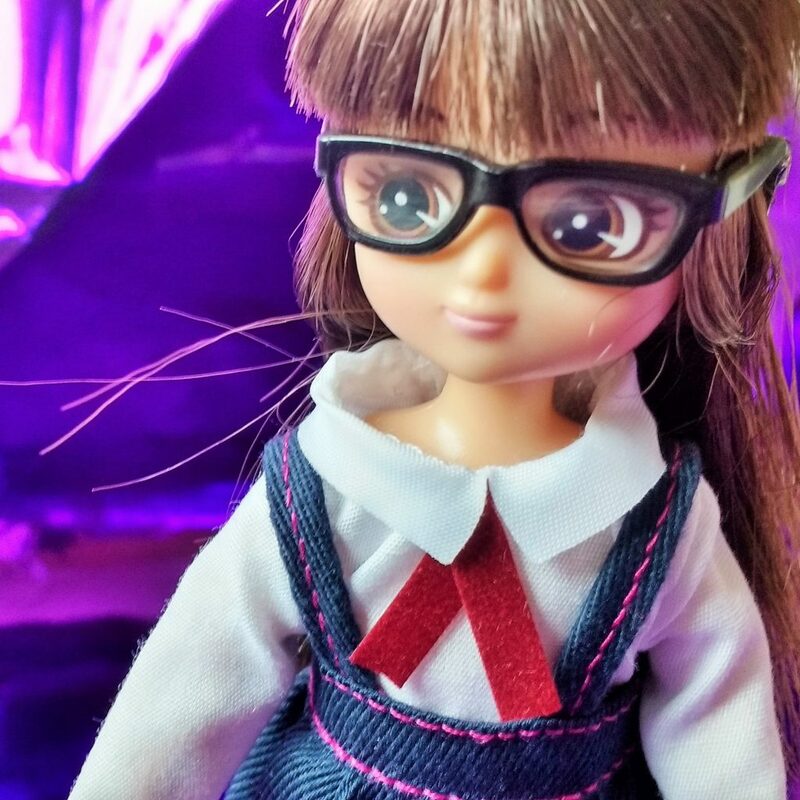 Lottie doll looks great and has wonderful sparkly accessories and normal items like glasses. Yes I love the sparkliness too! 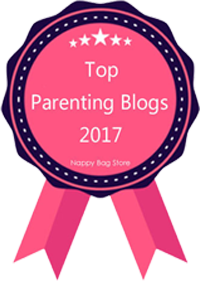 I love that Lottie dolls give real inspiration for the kids, rather than just ‘looking pretty’. 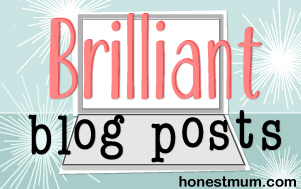 Me too – let’s inspire kids to DO something, rather than just sit around being pretty! Lottie dolls are my favorites for my 6 & 8 year old grandgirls!!!! They are easy to dress, with age appropriate everything! I’d never come across Lottie dolls before, but I’m sure our house will be full of them soon. Both my girls love her! I love that it’s natural. So nice compared to all the fake doll bodies! 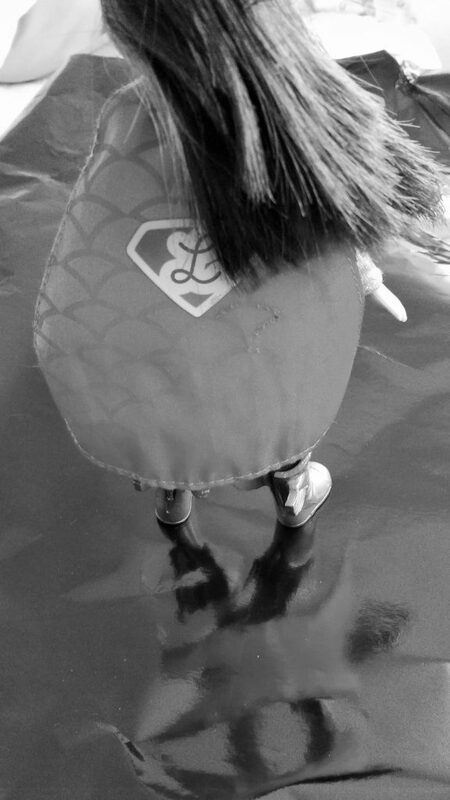 Love the School Days Lottie doll and the Superhero outfit. We have a few Lottie dolls (not this one though!) and I love the fact that she has a childlike body and isn’t ridiculously proportioned! My non-girly daughter loves Lottie because she’s not pink & frilly! I love the fact that she looks like a child. I love these dolls because they are realistic is body size and shape and encourage girls that they can be anything they want to be and that gender is no longer a restriction, I wish we had these dolls when I was little. 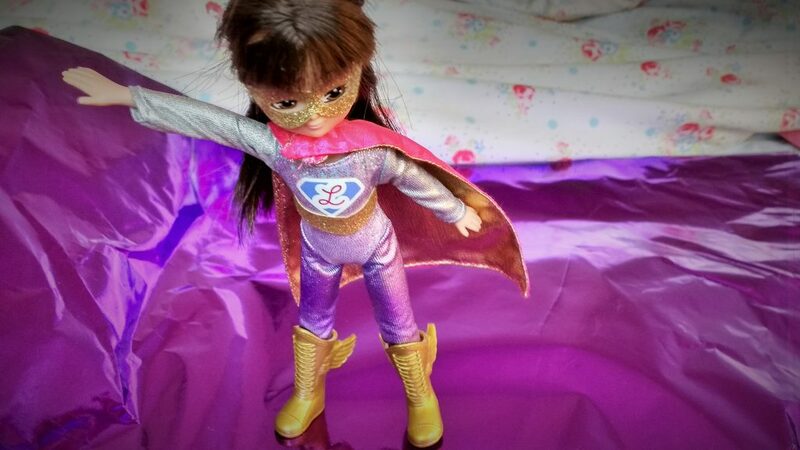 My grand daughter loves dressing up as a superhero and would love this doll. I like the look of the Lottie dolls, much better than Barbie. My Granddaughter Emily is 7 and I know she would love this doll. 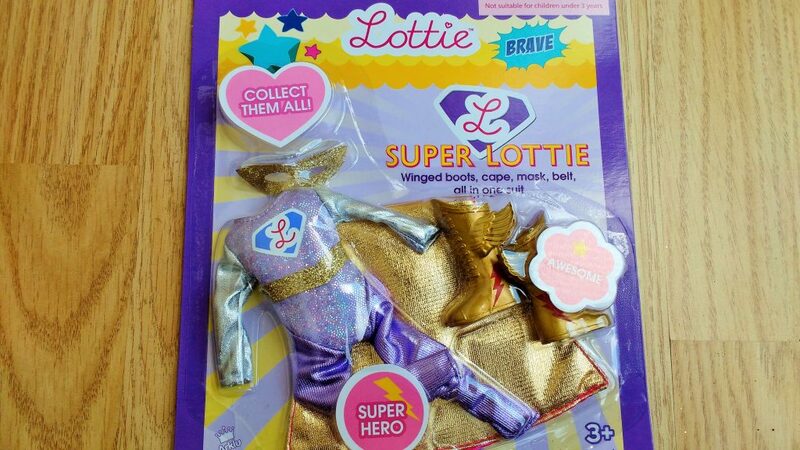 I have been thinking about buying her one, especially the martial arts Lottie. I like that they’re not too “pink” and steretyped – every girl would love these. That they keep my daughter quiet for hours on end!!! I love that there is a Lottie doll for everyone regardless of their interests and aspirations. I like the way that these dolls give girls a healthy body image and confidence and love the range of accessories for them too. 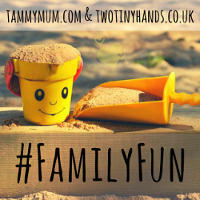 We have a muddy puddles lottie and my favourite thing about them is that they don’t have unrealistic bodies, but I also love that I can find one that reflects my child’s interests (which isn’t being a princess but rather jumping in muddy puddles lol!) . My only criticism is that I find it REALLY hard to put the clothes on and off – they are a bit snug and if lottie was my child id be saying you are growing out your clothes we need to go shopping ! I have a 4 year old little girl who is mad on dolls, unfortuantely all the Barbie dolls tend to look the same, even now they have made them wider, shorter etc, these look totally different and it is refreshing! Aw wow, love the modern outfits and glasses! She’s great, I know a beautiful little lady that would love to play with her! I loved the glasses too – so cute! 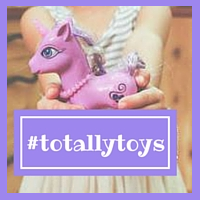 these look sparkly and fun, great for my daughter! I love the healthy body image on which it is based, and I think the accessories are great. Loving the glasses! It’s a great way to subtly encourage healthy body image 🙂 Thanks for your comment. I love that she is unique to other dolls like Barbie with a big chest and a short belt lol I love her outfit and it’s great to show girls that they can be Super Heroes just like the boys! Yup these are all reasons that I love her too! 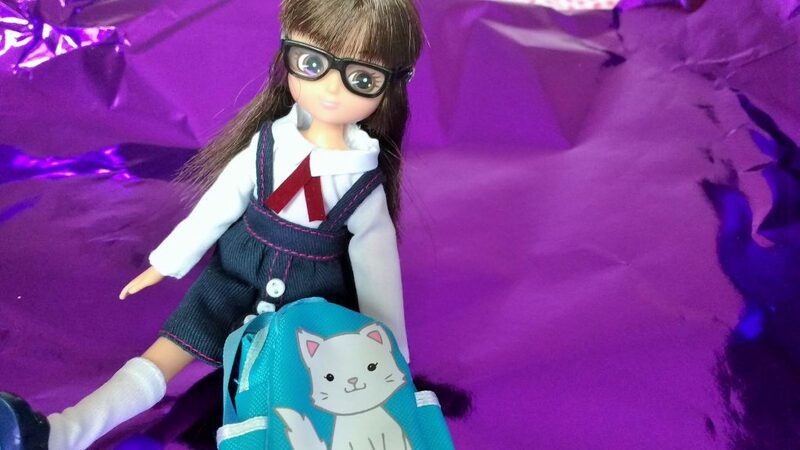 I love her because she is almost real and is of school age too which is lovely for children who go to, or are about to go to school. My Niece is not a big girly girl but loves dolls. She would adore the martial arts doll. Thanks for the chance. I like that she looks just like the normal girl next door that we all know. She is very natural and appealing and we have a Lottie in our family who would love her namesake. I love the outfits, and that she looks more like a real girl. She’s a young girl (much better than those teenage dolls). I love the sentiment that Girls can be Hero’s too and the fact she wears glasses. A wonderful creation in the world of ‘perfect’ Barbie and that ridiculous plastic notion. 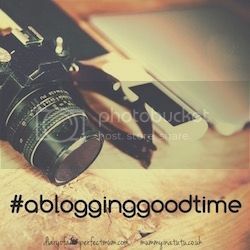 I love that she enjoys adventures and this will encourage my granddaughter to make up things for her to do! I think they are quite empowering for little girls and send a positive message. I love her superhero costume! It’s so sparkly and amazing! I think they are very sweet and would make any child very happy. Lottie is the first and only doll my niece has ever taken an interest in.